The SFP10GSRST is a Cisco SFP-10G-SR compatible fiber transceiver module that has been designed, programmed and tested to work with Cisco brand switches and routers. 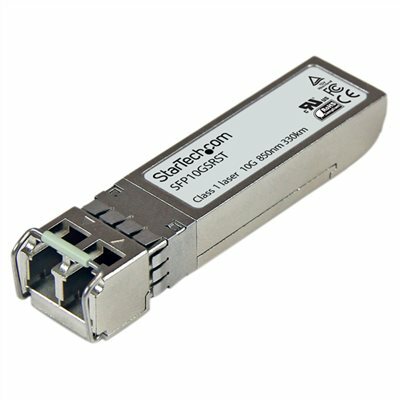 It delivers dependable 10GbE connectivity over fiber cable, for 10GBASE-SR compliant networks, with a maximum distance of up to 300 m (984 ft.).This SFP+ fiber module is hot-swappable, making upgrades and replacements seamless by minimizing network disruptions.StarTech.com offers a wide variety of SFP modules and direct-attach SFP cables, providing the convenience and reliability you need to ensure dependable network performance. Add, replace or upgrade SFP+ modules on 10G fiber equipment. The SFP10GSRST Cisco® Compatible 10GBase-SR SFP+ Fiber Transceiver Module 850nm MM LC w/DDM - 300m (984ft) is built to comply with MSA (Multi-Sourcing Agreement) standards to offer a cost-effective way to add, replace or upgrade a 10Gb SFP+ Multimode LC port on your fiber networking equipment or fiber media converter. Supporting data rates up to 11.1 Gbps as well as Digital Diagnostics Monitoring (DDM), this LC SFP+/Mini-GBIC module can be installed into any fiber networking device with an MSA or Cisco compliant 10GbE SFP+ port. Delivering both convenience and scalability, this fiber transceiver is fully hot-pluggable, which enables you to install the module without interrupting network traffic or requiring a device reboot. This 850nm multi-mode SFP+ module is compatible with the Cisco SFP-10G-SR transceiver. Backed by a StarTech.com 3-year warranty and free lifetime technical support.